Rendering service to the person Bhagavata, or the pure servant of God, is described throughout the Vedic literature as being more effective and more pleasing to the Lord than rendering service to the Supreme Lord directly. The person Bhagavata comes in the line of a genuine disciplic succession from the Lord, and through the disciplic succession the divine principle is transmitted to the humble spiritual aspirant. 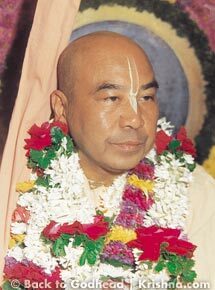 His Holiness Bhaktisvarupa Damodara Swami, also known as Sripada Maharaja, rendered sincere and loving service to his spiritual master, Srila Prabhupada, who belonged to the spiritual lineage of the Brahma-Madhva-Gaudiya-sampradaya. Sripada Maharaja was thus an ideal example of bhagavata-sevarpanam—offering service unto the Bhagavata. 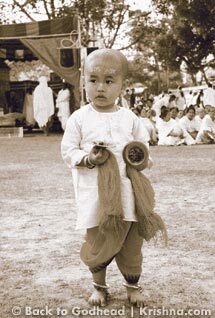 Sripada Maharaja was born in the ancient Vaishnava kingdom of Manipur, in northeast India, on December 9, 1937. 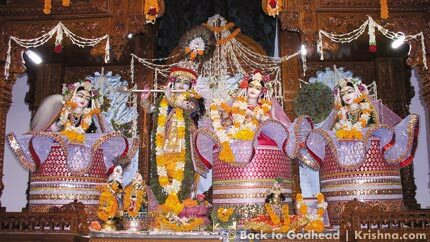 It was the holy day known as Odana-shashthi, when Lord Jagannatha is given new clothes. His parents were Sri Yogendra Singh and Srimati Kanyahanbi Devi. Being Vaishnavas, they named their child Damodara, one of the holy names of Lord Sri Krishna. Sri Yogendra Singh was a devotional singer in the Nata Sankirtana tradition, and so from the very moment of Damodara’s appearance in this world, his father filled his son’s ears with the devotional sounds of the holy names and pastimes of the Supreme Lord. As a youth Sripada Maharaja faced many hardships. Around the age of eight he lost his father, and just a couple of years later he and his sister were living on their own in poverty. Life was difficult, but throughout their hardships they remained courageous by taking shelter of the mercy of Lord Sri Krishna. He remained a naishthika-brahmachari (celibate monk) throughout his life. By the time Sripada Maharaja was twelve, he was forced to live alone and fend for himself by growing rice. He thus had no time to continue his studies. Sometime later his primary school teacher noticed his plight and along with a village elder arranged for a proper home and his further education. At fourteen, Sripada Maharaja became seriously ill with typhoid. The village physicians unanimously declared that he would soon die. But his guardian prayed daily for his recovery by reciting the Dashavatara-stotra, a prayer to Lord Sri Krishna’s ten incarnations. After fasting for forty days and drinking only whey, Sripada Maharaja miraculously recovered. Another time, Sripada Maharaja fell from a mango tree. He suddenly regained consciousness and quickly recovered from his injuries. Growing up, Sripada Maharaja was very much attracted to hearing about the pastimes of the Lord. He once spent the entire night watching the divine rasa-lila dance of Krishna and His gopis performed in traditional Manipuri style. He consequently missed his mathematics final examination the next day. Sripada Maharaja would also regularly take part in the deity worship of Radha-Krishna, Gaura-Nitai, and Jagannatha, Baladeva, and Subhadra in his village’s temple. Because of Sripada Maharaja’s respectful conduct, throughout his student life he developed lifelong relationships with teachers. Possessing the ability to become an expert in anything he set his mind to, he won scholarships that allowed him to further his education in Calcutta and ultimately in the United States. 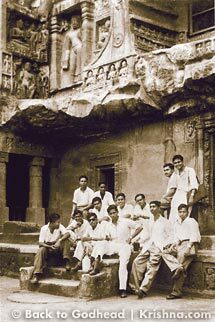 In the 1960s, for someone from the small state of Manipur, India, to make it all the way to the United States on scholarships was almost impossible. Yet by the mercy of the Supreme Lord, Sripada Maharaja won an overseas scholarship from India’s ministry of education. 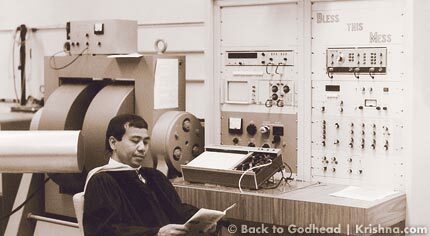 While doing his Ph.D. research work in chemistry at the University of California, Irvine, he met Srila Prabhupada. Sripada Maharaja quickly decided to dedicate his life in service to Srila Prabhupada and his mission. 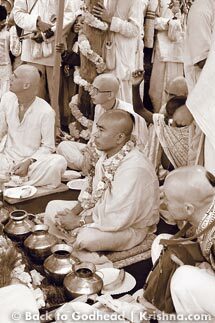 Sripada Maharaja received spiritual initiation from Srila Prabhupada, who gave him the spiritual name Svarupa Damodara Dasa. Later, after taking sannyasa initiation, the prefix Bhakti was added. Since then he has been known as Sripada Bhaktisvarupa Damodara Swami or Sripada Maharaja. 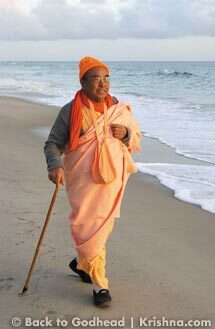 For the next eight years, beginning with Sripada Maharaja’s morning walks with Srila Prabhupada in the early 1970s on Venice Beach in California, to the last hours of Srila Prabhupada’s manifest pastimes in this world, in Vrindavana, 1977, Srila Prabhupada gave numerous instructions to Sripada Maharaja on how to properly introduce Bhagavata culture to the world’s intellectuals and leaders. These instructions were in the fields of science, philosophy, religion, Bhagavata cosmology, evolution, art, culture, and spiritual education, among others. 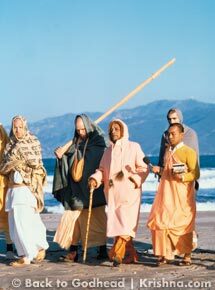 Some of the conversations between Srila Prabhupada and Sripada Maharaja that took place during their morning walks together on Venice Beach are now published and distributed by the Bhaktivedanta Book Trust (BBT) as the book Life Comes From Life. 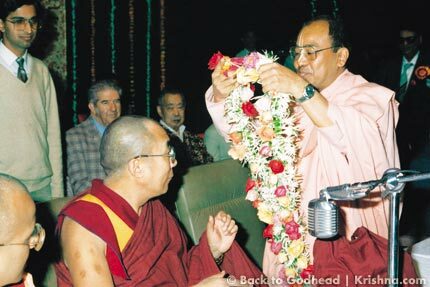 In 1973 Sripada Maharaja offered a small book to Srila Prabhupada at Prabhupada’s appearance-day celebration in Los Angeles. Srila Prabhupada liked the book so much that he ordered it to be printed and distributed in large numbers. The book—The Scientific Basis of Krishna Consciousness—is based on the instructions Sripada Maharaja received from Srila Prabhupada. Srila Prabhupada would often show the book to guests and tell them the book was written by one of his scientist disciples. He ordered the BBT to print over 100,000 copies. This book is still used extensively for presenting Krishna consciousness to students at colleges and universities throughout the world. Over a quarter million copies have been printed, and it has been translated into many languages. After Sripada Maharaja received his Ph.D. in physical organic chemistry in 1974, he went to Vrindavana to be with Srila Prabhupada. Srila Prabhupada told him he wanted to start an institute to present Krishna consciousness scientifically to intellectuals. He told Sripada Maharaja he wanted him to be the director of the institute. Sripada Maharaja humbly expressed his feeling of not being qualified for the position. Later, Sripada Maharaja suggested the name Bhaktivedanta Institute, and Srila Prabhupada humbly agreed. Srila Prabhupada instructed Sripada Maharaja on how to organize and operate the Institute. He gave him specific instructions on organizing conferences, giving lectures, writing books, and interacting with scholars and intellectuals. Srila Prabhupada saw in Sripada Maharaja a person who could fulfill these instructions, as he had a scientific background, a gentlemanly nature, and above all the qualities of a Vaishnava. In 1977 Sripada Maharaja gave a lecture on the scientific basis of Krishna consciousness at a large pandal (tent) program in Bombay. Srila Prabhupada was extremely pleased by his scientific presentation. Any disciple of Srila Prabhupada present when he and Sripada Maharaja were together recognized the beautiful relationship and loving exchanges that took place between them. 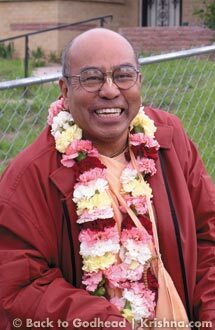 Sripada Maharaja took the instructions he received from Srila Prabhupada as his life and soul. Fulfilling these instructions was his offering of love, as a disciple, to his divine master, Srila Prabhupada. For the pleasure of Srila Prabhupada, Sripada Maharaja organized five major international conferences, in Vrindavana (1977), Mumbai (1986), San Francisco (1990), Kolkata (1997), and Rome (2004). These conferences exposed leaders of the scientific and spiritual communities to the Bhagavata perspective. He organized hundreds of seminars and symposiums and met with and interviewed several Nobel laureates, statesmen, and leading thinkers of the world, such as Charles Townes, William Phillips, Desmond Tutu, Pope John Paul II, the Dalai Llama, and Mother Theresa. In response to Srila Prabhupada’s instruction for him to write books, Sripada Maharaja published dozens of books on science and spirituality. 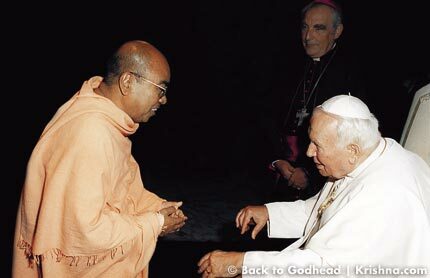 Srila Prabhupada told him, “You are a scientist; prove scientifically that God is a Person.” In 2006 he published God Is a Person, containing his dialogue with two of the world’s most prominent Nobel laureates. As instructed by Srila Prabhupada, Sripada Maharaja also wrote a scientific commentary on the first four verses of the Vedanta-sutra, which summarize the work. He also edited and published Savijnanam and Tattva-jijnasa, respectively the journal and the magazine of the Bhaktivedanta Institute. Today, in large part because of his books, Sripada Maharaja is recognized in major scientific and religious circles around the world and is considered one of the leading authorities on science and spirituality. To distribute the books of Srila Prabhupada and the Bhaktivedanta Institute to colleges and universities throughout India, Sripada Maharaja started the Bhaktivedanta Institute on Wheels. Currently three motorhome-style buses travel around India performing outreach work for the Institute. The members of the outreach team organize lectures and distribute books to students, professors, and libraries, promoting a dialogue between science and spirituality. In northeast India Sripada Maharaja started a network of primary and secondary schools to promote the goals of the Bhaktivedanta Institute. 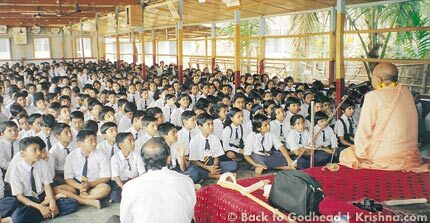 Over four thousand students attend these schools and receive a scientific education centered on the spiritual values of the Bhagavata tradition. Throughout his life, Sripada Maharaja attended numerous festivals and conferences all over the world. 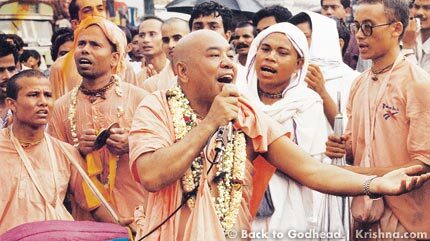 At these functions he introduced the divine principle of Vaishnava culture, which he had received from Srila Prabhupada. He did this through the literary, culinary, and performing arts at a myriad of venues ranging from urban schools to the most prestigious universities, from senior citizen centers to the Kennedy Center, from South America to Singapore, and to audiences from elementary school students to heads of state. Sripada Maharaja’s presenting and sharing of the divine principle of Vaishnava culture to countless people around the world makes him truly an ambassador of Bhagavata culture. To introduce the Bhagavata culture of Manipur to the world, in 1989 Sripada Maharaja founded the Ranganiketan Manipuri Cultural Arts Troupe. Ranganiketan is the largest and most frequently booked cultural arts troupe from India. As director of Ranganiketan, Sripada Maharaja shared the beautiful rasa-lila pastimes of Lord Sri Krishna with more than a million people, through approximately six hundred performances at over three hundred venues in more than fifteen countries. In Sripada Maharaja’s work to introduce the Bhagavata culture to society’s intellectuals, he interacted with many spiritual leaders of the world’s great faiths. He discussed with them the sublime and unifying points of the Bhagavata tradition, which many of them greatly appreciated. Sripada Maharaja felt that dialogue among the world’s religious leaders is a powerful way to create a culture of understanding that aids in discovering the commonalities among various religions and societies. The future depends on all religions working together to formulate a global standard of ethics and morality to guide human action in the right direction. For the last twenty-five years, Sripada Maharaja organized seminars and interreligious discussion groups around the world. 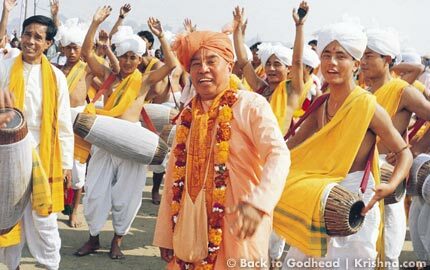 In addition, beginning in early 1980 in Manipur he led annual padayatras (walks) for peace and religious harmony. 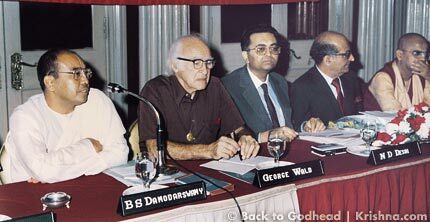 Sripada Maharaja was a global council member of the United Religions Initiative (URI), an international spiritual parallel of the United Nations. URI is the largest worldwide organization dedicated to spreading peace and understanding among the world’s religions. In the spirit of peace and harmony Srila Prabhupada told Sripada Maharaja, attending him in his last days, that he wanted to start the Bhaktivedanta Swami Charity Trust to bring unity among all Gaudiya Vaishnavas and to aid in the renovation of the ancient Gaudiya temples and holy sites. Sripada Maharaja worked hard to achieve this goal of peace and unity. Srila Prabhupada instructed Sripada Maharaja to make Manipur a scientific Vaishnava state. In this regard, Sripada Maharaja began building The University of Bhagavata Culture in Imphal, Manipur. Shining in the center of the university complex is the marvelous jewel-like temple, the Sri Sri Radha-Krishnacandra Manimandira. The grand opening of the temple will take place on November 21, 2007. All are welcome. Sripada Maharaja also inaugurated the construction of temples all over India, including Siliguri, Tirupati, Vijayawada, and Agartala. From his early childhood Sripada Maharaja was deeply influenced by the devotional art, music, and dance of Manipur. An accomplished singer, instrumentalist, and poet, he composed several Vaishnava poems and songs in the Manipuri language. He sang beautifully, bringing transcendental pleasure to those who heard him. Sripada Maharaja was and continues to be a spiritual master, teacher, and guide for thousands of people. Wherever he traveled, his friendship captivated and charmed people of all ages, faiths, and walks of life. His disciples have been touched by his example of dedicating himself completely to the instructions of his spiritual master. Desiring to continue his mission of serving Srila Prabhupada, Sripada Maharaja’s disciples are now taking the instructions they received from him as their life and soul. Sripada Maharaja passed from this world on the holy day known as Vijaya Dashami, during the period of the day when Lord Sri Krishna calls the gopis for His divine rasa-lila. Sripada Maharaja’s departure took place in Kolkata, the holy appearance place of his divine master Srila Prabhupada. Kolkata is also the site from which Srila Bhaktisiddhanta Sarasvati Thakura and Srila Bhaktivinoda Thakura left this world. Sripada Maharaja’s purified body was placed in samadhi (eternal meditation) at Sri Radha-kund, Vrindavana.